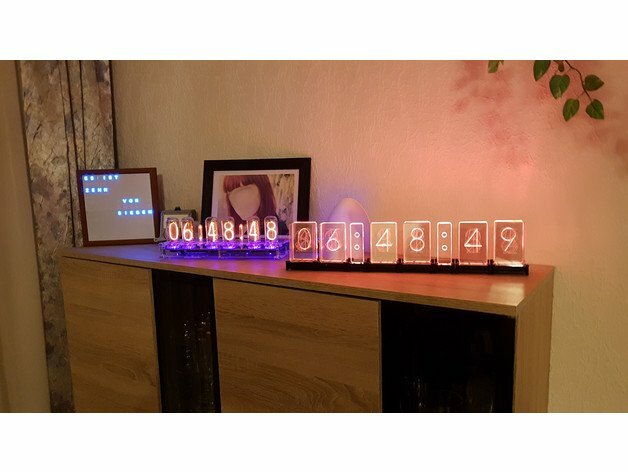 ESP8266 based Lixie Clock #3dprinting #3dthursday « Adafruit Industries – Makers, hackers, artists, designers and engineers! xSnowHeadx shared this project on Thingiverse! I already own some real nixie clocks and so want to have a lixie looking and acting as similar as possible like the nixies. So, based on Folkers lixie digit, I created digit positions for colons and used an ESP8266 NodeMCU for control to have a webinterface, can retrieve the time over NTP (no separate RTC-module necessary) and to be able to realize a smooth digit change. Additionally I created connectors to connect the digits and endpieces to let the sides look better.